There is nothing like dreaming of summer during the winter months whilst we are battling with blustery winds, regular downpours and chilly frozen mornings. We at Asmar Equestrian can’t make it summer for you but we can help you stay warm and dry during the colder months. The Longsleeve T- Mockneck and the Women’s AE Logo Longsleeve T provide perfect base layers to wear under the rest of your equestrian attire for extra warmth without the need for bulky layers. 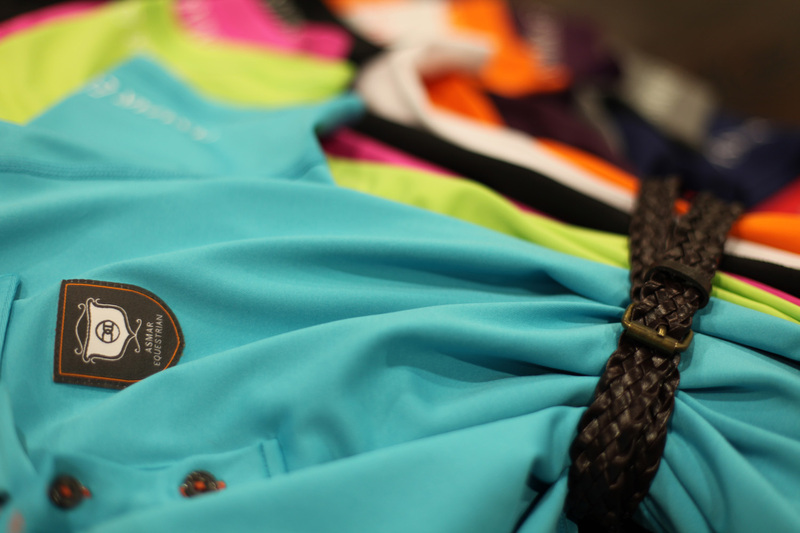 Perfect for layering the streamline tops from Asmar Equestrian provide a stylish way to look chic whilst keeping warm. The stretchy, flexible fabric allows you to move whether on the yard or whilst working and the clever technological design includes a Chitosante treatment which allows the garments to be absorbent, breathable, durable, fast-drying, static-free, wrinkle and pill resistant. The Asmar Equestrian All Weather Rider Jacket has been put to the test in this month’s Your Horse Magazine. The buyers’ guide offered by the magazine looks at and compares products provided by leading retailers. This month brought about the assessment of a range of Waterproof Jackets and we are pleased to declare the All Weather Rider Jacket stood up well to the competition! Reviews reported the All Weather Rider to be “slim fitting, flattering and looks smart” with testers saying the jacket is “well worth the money” and that “the hidden skirt and riding vent are fantastic, and make this jacket really comfortable for riding in whilst keeping your legs nice and dry.” To read the full review pick up a copy of Your Horse magazine today. We know our jacket is nothing like anything else on the market providing a true connection between style and functionality, but it is nice to know our testers agree! The design of the All Weather Rider is unique. This award winning jacket contains both front and back zips which unveil a hidden skirt. The skirt innovation fits comfortably and easily over your legs and saddle keeping you warm and dry, whatever the weather brings! When not in use the skirts simply snap back into place providing a truly elegant coat whether you are riding or hitting the high street! We have overstocked on a few products, so we are offering 40% off on selected items. Wide waistband and popular boot cut provides a comfortable, natural fit with plenty of coverage while bending and stretching. Features Chitosante treatment, which wicks away moisture and allows the garment to be absorbent, breathable, durable, fast-drying, static-free, wrinkle and pill resistant. Fade resistant over repeated washing. Stylish women’s jacket with a fabulous scrunched collar and long sleeves. Contains Chitosante treatment that wicks away moisture and allows the garment to be absorbent, breathable, durable, fast-drying, static-free, wrinkle and pill resistant. Men’s fitness pant with a relaxed fit. Features a wide waistband and drawstring pull. Chitosante treatment wicks away moisture and allows the garment to be absorbent, breathable, durable, fast-drying, static-free, wrinkle and pill resistant. Fade resistant over repeated washing. Limited edition Bamboo Turtleneck launched! Bamboo is a Chinese symbol for longevity because of its durability, strength, flexibility and resilience. Bamboo can survive through the harshest of conditions and stays strong no matter what Mother Nature may throw at us. 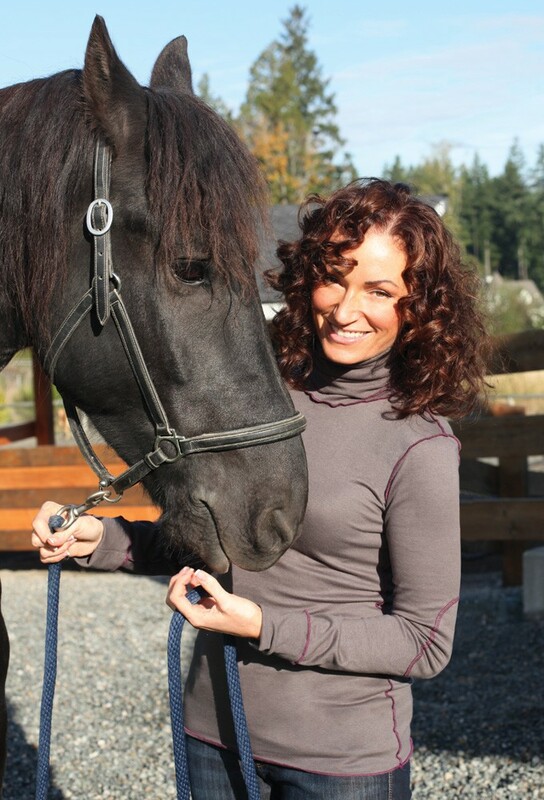 When most of our days are spent outdoors or in the saddle, wouldn’t it be great to have a top that could withstand the demand and pressure we expect to face? Our new Eco-Chic Turtlenecks embodies the power of bamboo. These new limited edition tops are made from a soft, stretchy luxurious bamboo/cotton/spandex blend. Ideal for any condition. They have extra long sleeves, which can be rolled up or left down to keep your hands cozy and warm. Available in Black, French Vanilla (cream), Cabernet (Burgundy), Aubergine (deep purple) and Shades of Grey (Charcoal) all with a beautiful contrast stitching on the seams and elbow patches. The popular award winning coat that transforms to keep you and most saddles dry in all weather conditions. Front and back skirt unveil behind a hidden zipper gusset to fit over your saddle. When the skirts are not in use, they snap elegantly into place. A truly functionable garment for any outdoor enthusiast. 3M Reflective safety piping at back. Zippered chest and side pockets for cell phone or personal items. Inside ribbed sleeve cuff to prevent hay and weather elements from entering.